TESTAMENT TO MAKE IN-STORE APPEARANCE AT UTOPIA RECORDS IN SYDNEY, AUSTRALIA! Thrash titans TESTAMENT are pleased to announce their upcoming appearance at Utopia Records in Sydney, Australia this Saturday, August 7th at 3:30pm! 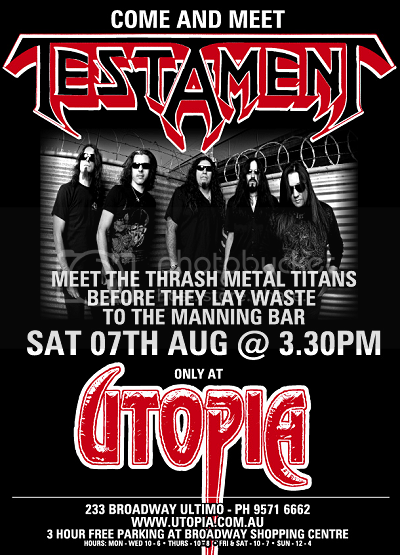 Stop in to Utopia to meet TESTAMENT before they perform at the Manning Bar that evening! After returning from their Australian onslaught, catch TESTAMENT in the United States on the AMERICAN CARNAGE TOUR with Slayer and Megadeth! TESTAMENT is offering a limited number of VIP Packages for every United States date on the tour. This is the fan’s chance to meet the band and get exclusive limited edition merchandise before TESTAMENT head into the studio to record the follow up to their Golden Gods “Album of the Year”, The Formation of Damnation! Now, the Testament VIP package offers some great additions, including an exclusive TESTAMENT Affliction T-shirt! Act now and make sure to take hold of this great opportunity to be a part of METAL HISTORY with TESTAMENT this summer!